In Denver, our dry heat keeps many bugs from living amongst us. Usually, this isn’t such a bad thing. We don’t miss the chiggers, the cockroaches, or other bugs found in other parts of the United States. We do miss the fireflies. I always enjoyed visiting my cousins who lived in the midwest and catching fireflies on warm summer nights. Since we can’t do that in Denver, and I don’t feel like driving to Kansas City, the girls and I made firefly jars. This is an easy activity that I have seen on Pinterest. Most people cut open glow sticks and empty them into a Mason jar. There are two problems with this – the liquid only glows for a short time and glow sticks contain glass which breaks to release and mix the chemicals. You can make firefly jars that glow over and over again. All you need is a few Mason jars, paint brushes, glue and Zinc Sulfide Glow Powder or Atomic Glow Concentrate. Fluorescence – This type of luminescence occurs when some form of radiation, such as light, causes an object to glow. For example, fluorescent papers and poster boards glow in the daylight. They glow even brighter under black light (ultraviolet light). Ultraviolet light is a component in sunlight. Ultraviolet wavelengths are very long with a very high frequency and can be used to detect fluorescent material that would remain invisible under normal conditions. When you shine ultraviolet light on fluorescent material, it lights up with a beautiful bluish-green luminescence. Phosphorescence – Phosphorescence is just like fluorescence, except that the glow continues even after the light used to excite it is removed. “Glow in the dark” toys phosphoresce brightly in total darkness after being “charged” or excited by ordinary white or ultraviolet light. Glow Powder contains zinc sulfide and works by absorbing surrounding light energy and then releases that energy when the lights go out. You can charge the zinc sulfide with white light or ultraviolet light from a black light. 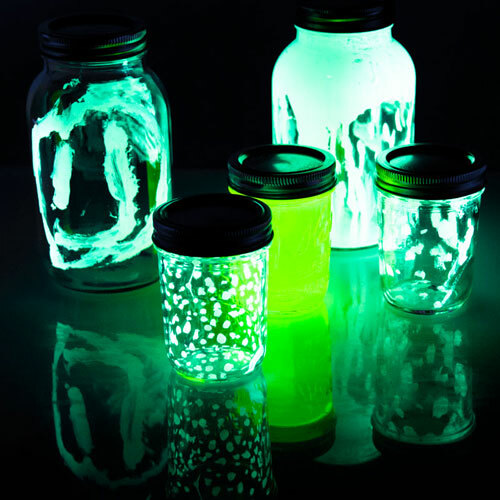 First decide if you want to make fluorescent or phosphorescent glowing jars. 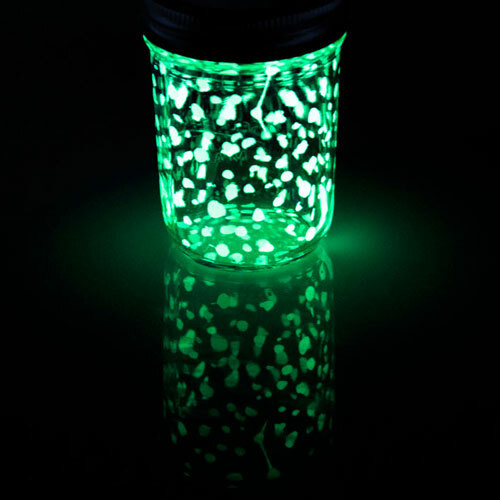 Remember, phosphorescent jars do not need a black light to charge the particles, but will need to be recharged often. 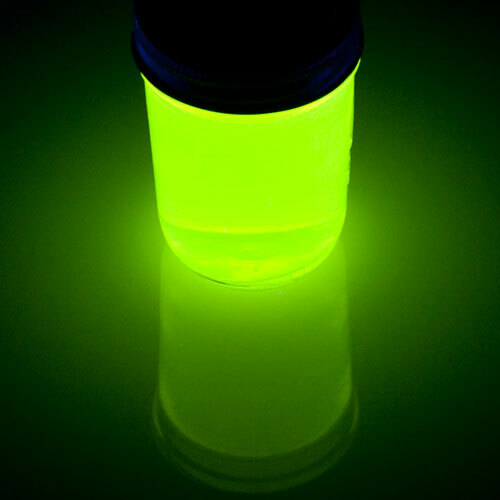 Mix Elmer’s glue with a few drops of Atomic Glow (fluorescent) or a few scoops of Glow Powder (phosphorescent). You can also fill the jar with tap water and then add a few drops of Atomic Glow then turn off the lights and turn on the black light. You will have a jar filled with glowing goo. Using a paint brush or cotton swab, paint in the jar. You can also let it drip and swirl in the jar. Charge in white light (phosphorescent) or place under black light (fluorescent). You can make cool glowing party drinks for your backyard bar-be-que using tonic water.Tonic water contains quinine, a chemical that glows under a black light. Quinine was added to tonic water to help fight off malaria. Tonic water still contains a small amount of quinine, which makes it a perfect material for glowing drinks. Add a little Tonic water to your drinks, then place a black light behind them. The drinks will glow in the night. Just keep in mind that darker drinks, like Cola won’t glow as well as clear drinks like Sprite. You can also make glowing ice cubes. Pour tonic water into an ice cube tray and freeze. Add the ice cubes to your drinks and place a black light under or behind them. For step by step instructions and more on the science of glow, visit our Fireflies in a Jar experiment page. As a crafter I was recently informed by someone of the glow in the dark jars. I thought how cool how do you do that. When she told me she actually cut glow sticks I was shocked, first it’s kinda toxic plus I thought about the glass. So I asked why didn’t you just buy glow in the dark paint? it was as if clouds cleared from her hazy mind. I think a lot of time people complicate things when it’s actually much simpler. Your welcome Jenny! We have been concerned about all of the projects that involve breaking open glow sticks that are circulating the Internet. There is definitely a better and safer way. I would really like to order some Glow Powder to make the Mason jar lamps for a science camp, but I have no idea how much to order! How many grams do you think would be needed to make 100 jars? Thanks!